SWISSFLEX HAS BEEN MANUFACTURING INTELLIGENT, PREMIUM-QUALITY BED SYSTEMS FOR 60 YEARS. Our products combine Swiss artisanship, technical expertise and a knack for innovation to create an unparalleled system designed to provide an individual solution to any need, as well as being highly functional, comfortable and versatile. As the leading global manufacturer of high-quality, sophisticated bed systems, Swissflex pays attention and cares to the smallest details. This is the secret to Swissflex’s success and has proved its worth for over half a century. GUARANTEEING THE BEST SOLUTION FOR YOUR SLEEP COMFORT. To personalise your swissbed, Swissflex provides a very extensive range of premium fabrics, which caters to any need. During production, Swissflex combines various materials in order to combine their strengths. For the best possible sleep experience. Also guarantees that your swissbed will be perfectly adapted both to your sleeping needs and to your interior. Do you know the secret to the ergonomic perfection? 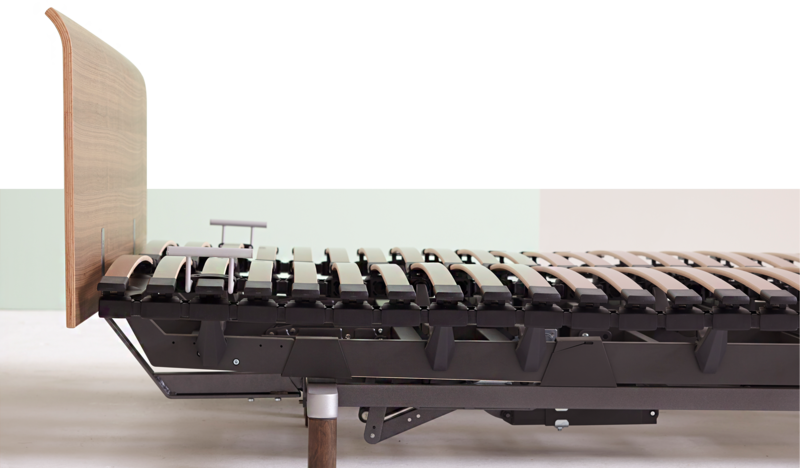 Swissflex’s innovative slat bases. Swissflex’s latest technology – bridge® – is the revolutionary result of years of development: it adjusts perfectly to any position and is compatible with any body type and sleeping position. Swissflex’ ergonomic pillows provide perfect sleep comfort, while the different versions all offer effective pressure relief and maximum support for the head and neck. Swissflex mattresses match the different body zones and thus optimise pressure relief. In addition, mattresses have specially shaped indentations that improve mechanical adjustability. In conjunction with the slat base, the mattress – which adapts to people’s individual needs – ensures perfect comfort. All Swissflex mattresses provide maximum pressure relief and excellent support and breathability. We invite you to Galip Kaynar Caddebostan Showroom for a closer look at Swissflex sleep systems. Please click for contact information.